The world is affected by the aging population and the National Health Service faces problem with sustainability. In these circumstances, innovative challenges are being conducted in each country and region to build a sustainable health care system. Challenge continues in each municipality towards the development of the integrated community care system in Japan. In this session, we would like to discuss the challenges of the activities aiming at elderly citizens in social security system in each country, aiming for "Elderly people in the area familiar to the end". Medical generalism in health care system from several countries will be presented. Based on their historic experience of medical generalism in each situation, issues and its potential solution for generalists’ clinical practice will be discussed. Also several important topics of our specialty such as efficient work with specialists and subspecialists in each system, subspecialty training for generalists, research directions will be elaborated. Discussion will take the Asian and Pacific regional issues such as disparity, rapid aging, rurality into considerations. This will create further discussion platform to talk how to enrich our specialty, generalist, in the future. To achieve this aim of the session, guest speakers who have vast knowledge of generalism in different countries including Singapore, UK, USA, and Japan will be participate as speakers. Active and fruitful participation with audience after the presentation by the guest speakers will also be expected. Common mental health problems such as depression are now the leading cause of disability worldwide. Yet there is a substantial treatment gap: less than one-quarter of those who would benefit from evidence-based interventions actually receive them. The integration of mental health and primary care is an international priority, and family medicine is well placed to provide effective patient care close to home. Family doctors have recently identified mental health issues as their most pressing educational need. This symposium, presented by leaders of the WONCA Working Party for Mental Health, will provide up-to-date information on key challenges and opportunities for the delivery of primary mental health care in the Asia-Pacific region. We will begin by describing the core competencies needed by family doctors to deliver high quality primary mental health care, using case examples to explain how they can work in daily clinical practice. 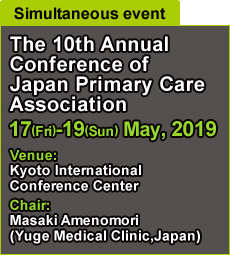 Then we will give the first international conference presentation of a Train the Trainers in Depression Course for family doctors in Japan, organised by WONCA and EACH (Internaional Association for Communication in Healthcare). This course is an excellent example of how to enable family doctors to increase their knowledge, skills and confidence in managing common mental health problems in primary care. In recent years, overuse of healthcare has been recognized as one of the major drivers of increasing healthcare costs and as an urgent priority for healthcare quality and patient safety in developed countries. There have been a number of attempts to address this issue by health care profession and the public. Notably, the Preventing Overdiagnosis Conferences, launched in 2013 and convened every year have led this awareness internationally. Similarly, “Too Much Medicine” by the BMJ, “Less Is More” by JAMA and “Right Care” by the Lown Institute/the Lancet are among the most influential in campaigns against overuse. The “Choosing Wisely” campaign, launched in 2012 by American Board of Internal Medicine Foundation, advocates for shared decision making in choosing care best-suited for each patient. Proposed by over 80 medical societies and supported by evidence, the “Top Five List” of procedures to be re-considered has been the cornerstone of the international success of this campaign. In order to implement these recommendations within the current healthcare environment which includes heightened public expectations of medical technologies, clinicians should embrace the professional ethical code outlined in the “Medical Professionalism in the New Millennium - a Physician Charter” (2002). In this session, international efforts to counter the healthcare overuse will be reviewed. Non-communicable diseases (NCDs) kill 41 million people annually, representing 71% of all deaths. Unhealthy diets, smoking, and physical inactivity increase the risk of NCDs. Most NCDs are preventable and manageable if appropriate screening and care are provided through the continuous monitoring of (potential) patients. Primary care is therefore critical, and investing more in primary care may be the most cost-effective approach for reducing NCD mortality and its societal burdens. There exit no health systems that have enough resources to afford all healthcare interventions regardless of price. We must therefore consider the costs and effectiveness of each medical intervention to achieve health systems that are catch-all and sustainable, especially in this era of fiscal decline. Health technology assessments (HTAs) are increasingly used internationally to help determine “best-buy” interventions and clinical guidelines. This session invites national experts in HTA from four Asia-Pacific countries (Indonesia, Japan, South Korea, and Thailand). Each speaker will discuss the roles and challenges of HTA policies for preventing and treating NCDs at the primary care level in their country. A panel discussion with all speakers will follow to share experiences and ideas to strengthen primary care systems and tackle NCDs through HTA-based approaches. Since 2013, the WONCA Working Party on Research has organized comparisons between WONCA Member Organizations of the status of primary health care and the policy to implement health systems reforms, in their country. These presentations were standardized through the use of an 11 slides’ power-point template – ‘the panel method’ and aimed to present, critically appraise and compare countries. The WONCA Asia Pacific region organized two highly successful comparisons that provided important insights in the regional status of family medicine and primary health care. Built on this success, the WONCA Working Party on Research proposes more in-depth comparisons between countries, of the role, structure, organization, training and performance of primary health care. The aim of this Workshop is to review the experiences with the panel method, and explore how its findings can inform policy makers. Presentations will explore recent primary health care innovations in Hong Kong, Taiwan and Thailand, the importance of empirical primary health care data for health-economists and how the International Classification of Primary Care (ICPC) in its current revision to ICPC-3 can support comparisons. Based on the Workshop findings, future comparative studies – in the region and/or at a WONCA global level – can be planned. WONCA has declared the importance of Young Doctors Movement to promote the implementation of UHC: Universal Health Coverage that WHO already has put forward and the education for bringing up younger family doctors. On the other hand, Japan has just introduced the new education and certification system designed by Japanese Medical Specialty Board, expecting younger generations to have their own career as family doctors/general practitioners to care the patients, the community, and the nation. In this session, firstly, we want to discuss why we emphasize YDM for our academic activities. The campaign of YDM has expanded gradually so far. Secondly, leaders of YDM from the Asia-Pacific Region and other regions will make a brief presentation of their own viewpoints regarding the situations of their own countries, why they commit to YDM, and the challenges of nowadays. These presentations will be expected to trigger our ideas and motivations, and give awareness of the importance of thinking globally and having action plans for achieving UHC. We also expect the ex-chair of WONCA, Amanda Howe to listen to the voice of younger generations and give us brilliant advice for the future.